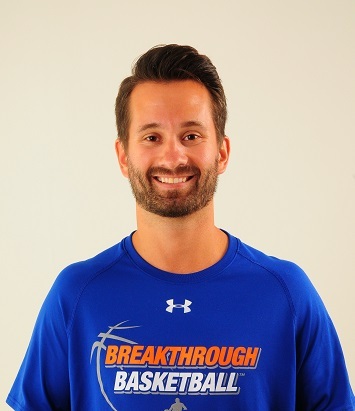 Joe Haefner is a co-founder of Breakthrough Basketball. Joe has head coach and assistant coach experience at every level from 3rd grade to High School Varsity. Joe also coached a team that played in the Kansas 6A state championship game during the 2010-11 season. The same team finished the season nationally ranked at #52 reaching as high as #27. Joe has also had opportunities to workout and train some high level players. This includes NBA draft picks and players that have attended Duke, Michigan State, and other college programs at all levels. Joe also spent a significant amount of time training Kyle Wolf who developed into a Missouri Gatorade Player of the Year. Joe started playing basketball when he was 5 years old and he played all the way through high school where he was an All-Conference player as a junior and senior at Anamosa High School. Joe also played in the Big Bend / Big East All Star Game and won the 3-point shooting contest. Joe is also passionate about athletic development. He became certified as "Level 1 Youth Fitness Specialist" by the IYCA (International Youth Conditioning Association). If you'd like to send Joe an email, click here.